Still waiting to see what the Vegas Golden Knights' uniforms will look like. While do, here are a couple of ideas from Jonathan Sparks. And as a bonus, here's a revision to the team's logo from Ross Taylor — under the heading, simpler is often better. The Toronto Maple Leafs recently unveiled their new logo, but what if they'd gone another way? Ross Taylor proposed this centennial set prior to the reveal but it's still worth a good look. The ECHL's Quad City Mallards hosted a special jersey design contest in October. A handful of artists wanted to share there work with the Icethetics community. What do you think? Ross Taylor has a sharp, classic look. Eric Andrews went with something simple. And finally, Christian Legault decided on a faux retro sweater. Hard to pick a favorite here. 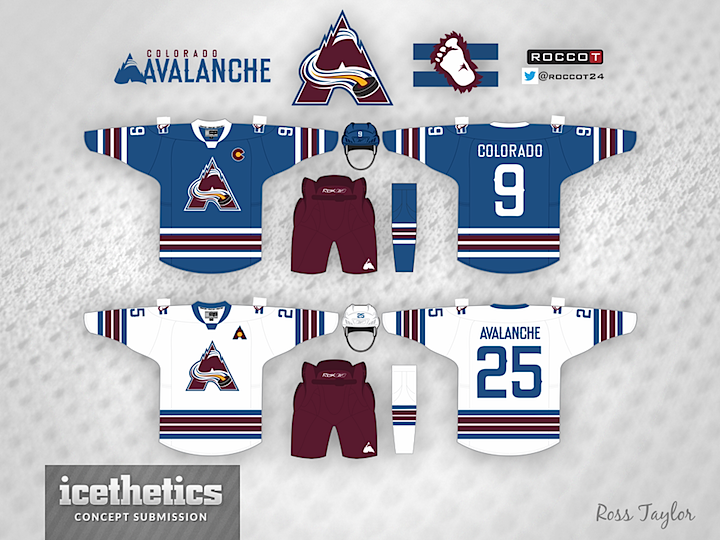 Ross Taylor is a talented artist and long time friend of Icethetics, so I've done him a disservice by waiting so long to post a concept he submitted way back in 2011. But better late than never, right? It's well past time for the Ottawa Senators to update their uniforms, but I'm not in favor of their heritage jerseys as many others are. Some classics should be left for special occasions. However, this rarely used alternate logo really needs to see time on the front of a jersey to remind us how good this team looked when it was introduced back in the '90s. Am I alone here? Ross Taylor is rather proud of Colorado Rockalanche concept — a combination of the Avs and the Rockies. As well he should be, as it's among the highest rated concepts of all time on this site. But he's revisiting it again — only this time he's adapting it specifically for the Colorado Avalanche. Future Winter Classic or Stadium Series game?